= Sensei, amari kinishinaide kudasai. = Don’t worry about it so much, Teach. = Recently I think about Nino often…/ I kind of like Nino now. Today’s lesson is from a question from my Twitter follower, Yuki! She asked me what is the difference between 気になる ( = kininaru ) and 気にする ( = kininsuru) and in what situation we use them. It is too hard to answer this question on Twitter, so I made this lesson for her. Hope this lesson helps all of you! 気 ( = ki) means “feeling, sentiment, mind, air”, or something more profound or spiritual, like “active (life) energy” , “undefinable power”, or “prana”. Japanese people have respected this invisible energy since ancient times. Of course there are tons of idioms with 気 ( = ki) but I will just focus on 気になる ( = kininaru ) and 気にする ( = kininsuru) today. Now let’s compare the following sentences. While a) means you are just curious about the gossip b) means you have something to do with the rumor (possibly people are talking about you) and you are brooding over it. 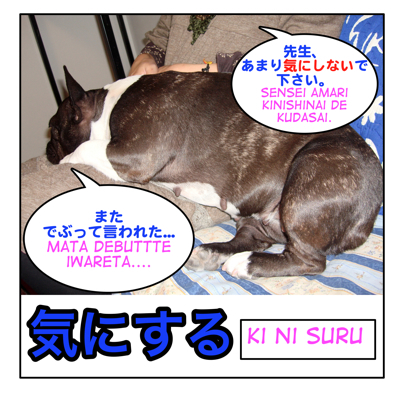 But sometimes 気にする ( = kinisuru）and 気になる ( = kininaru) are interchangeable. = Maggie wa futotta to iwareta koto wo zutto kini shite imashita. = Maggie wa futotta to iwareta koto ga zutto kini natte imashita. The direct translation of d) is Being told she has put on weight has been bothering Maggie. c) + d) Maggie has been brooding ever since someone told her she put some weight. Now I will show you the difference with more example sentences. = to worry about the result of the exam. Note : This could be before or after you get the results. = Kare wa itsumo hito no iken wo ki ni shite iru. = He always worries about what other people think. = Joushi ni iyana koto wo iwarete mo ki ni shinai dene. = Don’t worry even if your boss says something annoying. = Komakai koto wa ki ni shinai de kudasai. = Don’t worry about the small things. = Maggie sensei wa sonna sasai na koto wa ki ni shinai. = Maggie sensei doesn’t worry about the small things. = Saikin gaiken wo ki ni shite bakari iru dansei ga fuete kita. = Sekkaku no hatsu deito nano ni kare wa jikan bakari ki ni shite ita. = It was our first date, but he just kept looking at his watch. ★To care about someone or something. = Haha wa itsumo watashi ga chanto tabete iru ka ki ni shite iru. = My mother always worries if I am eating properly or not. = Itsumo watashi no koto ki ni shite kurete arigatou! = Thank you for always caring about me. There is a similar idiom , 気にかける ( = ki ni kakeru) but it shows deeper concerns. = Tonari ni suwatta hito no heddohon kara no otomore ga ki ni naru. = The sound leakage from the headphone of the person who sits next to me bothers me. = Aitsu no ano warai kata ga ki ni naru. =The way he laughs gets on my nerve. = Naganen issho ni sunde iru to aite no yaru koto hitotsu hitotsu ga ki ni natte kuru. = Since we’ve lived together so long, every single thing he does gets on my nerves. = Kongetsu no denkidai ga ki ni naru. = I’m worried about the electric bill this month. = Chichi no youtai ga ki ni naru. = I am concerned about my father’s condition. = Chichi no youtai ga shinpai da. We can tell the (medical) condition of his father is very critical and the speaker really worries about his condition. = Ninoude no shibou ga ki ni natte kita. = The fat of my upper arms has started to bother me. = Kono naka kara ki ni naru shoujou ga arimasu ka? = Are there any symptoms which bother you? = Inaka ni sunde kara hayaoki ga ki ni naranaku natta. = Since I moved to the country, I don’t mind getting up early. = Ano dorama no ketsumatsu ga ki ni naru. = I am curious about how the drama ends. = Saikin ki ni naru onna no ko ga iru. = There is a girl that I like / am interested in lately. = Dare ka ki ni naru hito ga iru no? = Is there anybody you like? * It is often used for romantic interests. Note : Japanese culture is very vague (曖昧 = aimai lesson) and often avoids straight expressions. = Yatto benkyou suru ki ni natte kita. = I finally feel like studying. = Honnin ga yaru ki ni naru made machimashou. = Let’s wait until she/he feels like doing/ get more motivated. = Ki ni suruna to iwarete mo ki ni naru. = Namae mo shiranai ki ni naru deshou. = It will be a tree without a name. Actually the tree has a name, Monkeypod, and it is found in Hawaii. 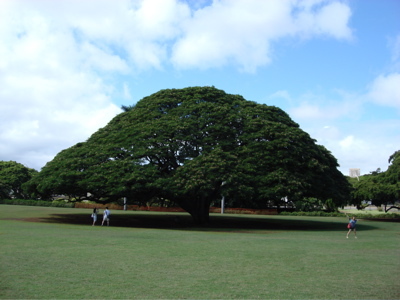 Many Japanese tourists keep visiting this tree in the Moanalua Gardens in Oahu where the commercial was shot. I wonder what Hawaiian people think about this phenomenon. I have been there as a Japanese tourist,too. And yes, it was a beautiful tree. = Saikin dare ka ki ni naru hito wa imasu ka? = Is there anybody you are interested in recently? Thank you for the wonderful lesson once again. I’m just wondering why after some verbs, there’s きた? Can I also use any verbs in front of that grammar pattern or only suru verbs? the pattern ～てきた implies here that a change has happened. In English you can translate ～てきた as: “started to”. Q: Can I also use any verbs in front of that grammar pattern or only suru verbs? A: There’s no limitation. However, the sentence must be logical of course. Sorry for my late reply. Thank you for your help! ササと / サッサと・さっさと is a mimetic word to describe some quick movement. So in this case, you emphasize the word 早く (fast). Can i use (verb plain form)気がある to modify 気? So 立ち入る気がない means “I don’t meant to intrude. I just wanted to ask what is the meaning and role of this word on each line ’cause I can’t seem to make out the meaning of it using its usual use as ‘to do’ with する. And what would be its english translation for you. But it sounds like since 気になる has a few different meanings does it make it hard to infer based on the context of the sentence what the usage is for those scenarios? Hello. What I’m trying to say since 気になる has quite a lot of meanings how does someone figure out if they are curious/interested/annoyed based on what they are trying to say in a sentence? Usually we know the meaning by the context. Thank you so much! 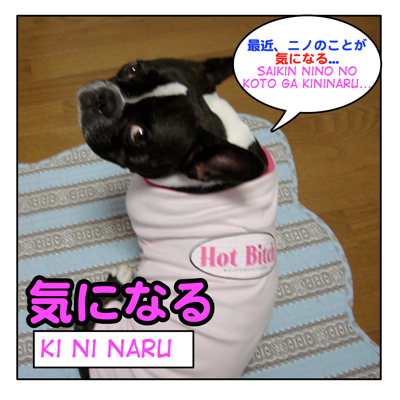 Because there are different meanings behind ki ni naru, I was never completely sure what it meant. This is so helpful! Thank you! Hi,Jenna! よかった! Now you know the difference! Thank you for spotting the typo. I fixed it. Yes, please visit this site more often. As for the quiz, check May 1st quiz in Maggie’s room on this site. •みつかってよかったです。→ It is grammatically correct but not natural. We use this phrase when you find something you have been looking for. So （このブログを）みつけることができて(or このブログにであえて）よかったです。or うれしいです。 will be more natural. Great post, I always wondered about the difference between those two — sounds like its pretty subtle in meaning, but the difference is more in usage. tried to say: since I am going to Japan next week, I am getting concerned about my Japanese ability. Thanks again for your lesson. I don’t know how you do it, but keep it up! I tried 合気道 for 6 months in past. It was wonderful! Doh! I forgot the に！lol Yes Aikido is great. I’ve been doing it for nearly four years now and I love it! Oh then you are an expert of “気” !! Lol Nope, I’m only scratching the surface — just like Japanese, it’s a lifelong pursuit! Ex. 彼は食(た）べてばかりいる =He is always eating. / He just keeps eating. Ex. Bruceは勉強（べんきょう）ばかりしている = Bruce is always studying. Ex. マギーは仕事（しごと）をしないで遊（あそ）んでばかりいる。= Maggie just plays around and she doesn’t work. Feel free to make a sentence. I can correct you.